Uaimh-Binn ar Stafa, a bhí tráth ina chuid d'eastát Chlann Guaire. Ard-Ghinearálta Lachlan Mac Guaire CB , "Athair na hAstráile." Armas a bhain le Thaoiseach Chlann Guaire in Ulbha. 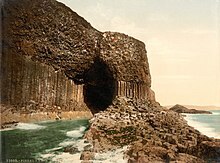 Clann ársa is ea Clann Guaire i nGaeltacht na hAlban ar a raibh úinéireacht na n-oileán Ulva, Staffa agus Gòmastra, chomh maith le réimsí móra talún ar Oileán Muile, atá lonnaithe ar fad sna h-Eileanan a-staigh. Ceann de sheacht 'Sìol Ailpein' is ea í Clann Guaire, sliocht uasal Ríthe na gCruithneach agus na nDál Riata. Ceann den cheithre clanna is sine san Ghàidhealtachd agus is féidir an shliocht a rianú chun an 9ú haois, go dtí Cináed mac Ailpin, céad Rí na nAlbannach. Déanann lámhscríbhinn 1450 cur síos ar shliocht Chlann Guaire, ó Ghuaire, deartháir Fionghan (sinsear Clann Fhionghain) agus Anrias (sinsear Clan Gregor ). Ba trodaithe fiochmhara iad i gCogaí Shaoirse na hAlban agus throid siad mar thacaíocht don rí Roibeart Brús ag Blàr Allt a' Bhonnaich sa bhliain 1314. ↑ Skene, vol. 2, lgh. 263-264. Tugadh an leathanach seo cothrom le dáta an 22 Feabhra 2019 ag 02:39.